Recent developments in regional anesthesia have resulted in a number of innovative and refined options to practitioners, often allowing regional techniques to be used for patients with presumed difficult airways. However, not every surgery can be performed under regional anesthesia. In addition, even in the hands of the most skilled regional anesthesiologist, blocks are subject to a certain rate of complications or failure.1−4 In addition, there are many situations in which the anesthesiologist is called on to secure an airway in less than ideal circumstances. Expertise with regional anesthesia of the airway allows intubation in awake patients with suspected difficult intubation, upper airway trauma, or cervical spine fractures. Therefore, it is essential that every regional anesthesiologist be skilled in the administration of general anesthesia and especially in the management of the difficult airway. In recent years, there have been many advances in difficult airway management. The introduction of the laryngeal mask airway, and later the intubating laryngeal mask airway have changed the American Society of Anesthesiologists’ difficult airway algorithm significantly.5 Despite new devices and techniques being added to the arsenal daily, the mainstay of difficult airway management remains flexible fiberoptic laryngobronchoscopic intubation. Fiberoptic intubation can be performed under a variety of conditions. However, one major decision must be made with every procedure will the patient be intubated while under general anesthesia, or does the patient need to be awake during intubation?6 Intubation under general anesthesia (even with inhalational induction and spontaneous respiration) carries the inherent risk of losing control of the difficult airway. For this reason, many anesthesiologists, on recognition of a difficult airway, elect to perform an awake intubation using either fiber optic laryngobronchoscopy or awake direct laryngoscopy. Direct laryngoscopy in an awake, unprepared patient can be extremely challenging. Excessive salivation and gag and cough reflexes can make intubation difficult, if not impossible, under awake conditions. In addition, the stress and discomfort may lead to undesirable elevations in the patient’s sympathetic and parasympathetic outflow. Several highly effective topical and regional anesthesia techniques have been developed to subdue these reflexes and facilitate intubation. Each of these techniques has the common goal of reducing sensation over the specific regions that will be encountered by the fiber optic bronchoscope and endotracheal tube. Figure 1: Innervation of the airway passages. To decide on a proper approach to an awake fiberoptic intubation, one must determine what structures need to be anesthetized along the two basic routes of intubation (oral or nasal) to facilitate optimal surgical conditions in the context of patient-specific anatomic considerations. Each of these routes has a well-defined pattern of innervation that can be specifically blocked to provide adequate anesthesia. Figure 2: Innervation of the larynx. 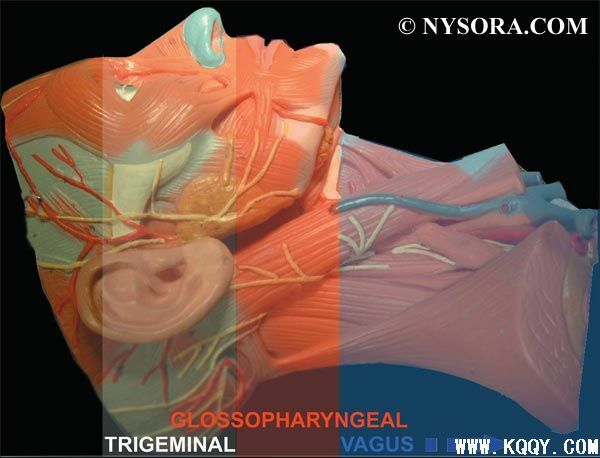 The oropharynx is innervated by branches of the vagus, facial and glossopharyngeal nerves (Figure 1). These nerves travel anterior along the lateral surface of the pharynx, and the three branches provide sensory innervation to the posterior third of the tongue, the vallecula, the anterior surface of the epiglottis (lingual branch), the walls of the pharynx (pharyngeal branch), and the tonsils (tonsillar branch). The sensory innervation of the anterior two thirds of the tongue is provided by the trigeminal nerve (lingual branch of the mandibular division).8 Given that it is not a part of the reflex arcs controlling gag or cough, its blockade is not essential for comfort during fiberoptic intubation. Three major neural pathways supply sensation to airway structures (see Figure 1). 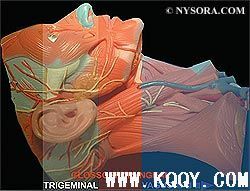 Terminal branches of the ophthalmic and maxillary divisions of the trigeminal nerve supply the nasal cavity and turbinates. The oropharynx and posterior third of the tongue are supplied by the glossopharyngeal nerve. Branches of the vagus nerve innervate the epiglottis and more distal airway structures. Antisialogogues should be used before any airway instrumentation. Oral secretions may make visualization via the fiberoptic equipment difficult and may serve as a barrier to effective penetration of local anesthetic into the mucosa. Glycopyrrolate 0.4 mg given intramuscularly or intravenously helps to diminish secretions.10 Alternatively, atropine 0.5–1 mg may be used intramuscularly or intravenously to similar effect. Intramuscular administration is favored over intravenous administration to avoid undesired side effects such as tachycardia and, less commonly, psychosis (with atropine) (Table 1). Figure 3: Topicalization of the mouth mucosa using a benzocaine spray. One way to achieve anesthesia for oral or nasal fiberoptic intubation is to topicalize the structures involved with a local anesthetic. Topicalization of the airway is the spreading of local anesthetic over a region of mucosa to achieve local uptake and neural blockade of that region. By far, the simplest of these techniques involves the spraying or swishing of local anesthetic directly onto themucosa of the mouth, pharynx, tongue, and/or nose. This can be accomplished with any of the many commercially available local anesthetics, particularly viscous lidocaine preparations and mixtures of benzocaine and tetracaine. The popular benzocaine (Cetacaine), a pressurized solution of benzocaine, tetracaine, and butamben in a small canister, delivers a spray via a long spray nozzle that is pointed in the desired direction (Figure 3). The anesthetic is delivered in an oily foam, which is absorbed rapidly into the mucosa and provides excellent topical anesthesia of the mucosa. Topicalization can also be accomplished by the use of local anesthetic-soaked cotton pledgets or swabs. These are soaked in either viscous or aqueous solutions of local anesthetic and then left for 5–15 minutes on the region of mucosa that requires anesthesia. The cotton acts as a reservoir for the anesthetic agent, producing a dense block. This technique is especially effective in the nasal passages. In the past, cocaine-soaked pledgets were used because they resulted both in a superb local anesthetic effect and in localized vasoconstriction. This practice has fallen out of favor, however, as concerns about cocaine toxicity grew. In addition, because of cocaine’s high profile as an illicit drug, there are significant regulatory hurdles associated with stocking it in a hospital formulary (eg, DEA paperwork, theft, accurate accounting of usage). As a method of achieving similar results, most clinicians have used the technique of adding small concentrations of epinephrine (1:200,000 or less) or phenylephrine (0.05%) to lidocaine. Alternatively, a vasoconstricting nasal spray can be applied before application of the local anesthetic. This approach results in dry mucosa, which then can be more easily anesthetized with local anesthetic because the local anesthetic does not get diluted with nasal secretions or saliva. The resulting vasoconstriction is nearly as effective as that of cocaine and offsets lidocaine’s powerful vasodilatation. The applicationof highly concentrated local anesthetic-soaked cotton pledget reservoirs can be exploited to achieve highly specific nerve blocks as well. These methods are detailed later with the description of individual nerve blocks. Figure 4: Anesthetizing airway using inhalation of aerosolized lidocaine. 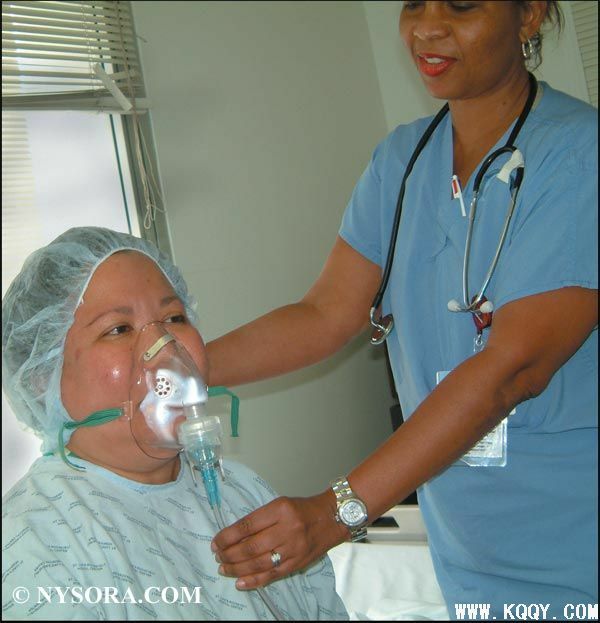 Inhalation of aerosolized local anesthetic is another simple technique to achieve oropharyngeal anesthesia. 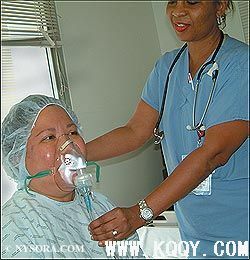 To perform this technique, local anesthetic is added to a standard nebulizer with a mouthpiece or face mask attached. The patient is then asked to inhale the local anesthetic vapor deeply. After a period of approximately 15–30 minutes, the patient should have inhaled a sufficient quantity of local anesthetic to achieve a reasonably good level of topical anesthesia throughout the oropharynx and trachea. Focused aerosolized local anesthetic from an atomizer is ideal for nasal intubation. A number of disposable commercially available syringe-powered atomizers are available but are deficient in achieving small particle size unless outfitted with a side-stream air/oxygen flow to enhance dispersion by virtue of the Venturi principle (Figure 4). The major advantage of this technique lies in its simplicity and lack of discomfort. In addition, very little working knowledge of the anatomy of the region is required for its successful implementation. Although this technique may seem ideal, it does have some drawbacks that limit its usefulness. The main disadvantage is that the density of the anesthesia achieved throughout the airway is highly variable. Many patients still experience an intact cough reflex, which can make intubation technically challenging. The rate of onset of this technique is highly dependent on patient compliance. Many patients who need an awake intubation are incapable or unwilling to take deep breaths. Also, inhalation of local anesthetic vapors can lead to central nervous system depression in patients whose mental status may already be depressed owing to other disease processes. Topicalization is the simplest method for anesthetizing the airway. Local anesthetic can be sprayed directly onto the desired mucosa. Nebulization of lidocaine 2–4% via face mask or oral nebulizer for 15–30 minutes can achieve highly effective anesthesia of the oral cavity and trachea for intubation. Atomization is ideal for airway topicalization during nasotracheal intubations. Density of anesthesia is variable and often requires supplementation to facilitate intubation. Anesthetic-soaked cotton can be applied to targetedmucosal surfaces for 5–15 minutes to effect selective blockade of underlying nerves. Vasoconstrictors such as epinephrine (1:200,000) or phenylephrine (0.05%) can be added to the solution to reduce mucosal bleeding. Adequate time allocation is needed to achieve optimal conditions. The oropharynx, soft palate, posterior portion of the tongue, and the pharyngeal surface of the epiglottis are innervated by the glossopharyngeal nerve. Block of the glossopharyngeal nerve facilitates endotracheal intubation by blocking the gag reflex associated with direct laryngoscopy as well as facilitating passage of a nasotracheal tube through the posterior pharynx. The glossopharyngeal nerve travels anterior along the lateral surface of the pharynx, and its three branches provide sensory innervation to the posterior third of the tongue, the vallecula, the anterior surface of the epiglottis (lingual branch), the walls of the pharynx (pharyngeal branch), and the tonsils (tonsillar branch). Logically, blockade of this nerve bilaterallywould result in anesthesia of those structures. The glossopharyngeal nerve can be anesthetized using either intraoral or extraoral (peristyloid) approaches. For the intraoral approach, the mouth is opened and the tongue is anesthetized with topical anesthetic. A 3 1/3 -in., 22-gaugue needle is used to place 5 mL of local anesthetic solution submucosally at the caudal aspect of the posterior tonsillar pillar (palatopharyngeal fold) (Figure 5) To perform the peristyloid approach to the glossopharyngeal block, the patient is placed supine and a line is drawn between the angle of the mandible and the mastoid process. Using deep pressure, the styloid process is palpated just posterior to the angle of the jaw along this line, and a short, small-gauge needle is seated against the styloid process. The needle is then withdrawn slightly and directed posteriorly off the styloid process. As soon as bony contact is lost, 5–7 mL of local anesthetic solution are injected after careful aspiration for blood. Both approaches involve deposition of local anesthetic in close proximity to the carotid artery, and careful aspiration before injection is essential. The applications of this block are limited by the specific anatomic regions that are innervated by the glossopharyngeal nerve. It is essential to ablate deep pressure symptoms from the tongue base during direct laryngoscopy. Blockade of the glossopharyngeal nerve is an integral part of effective block combinations, which is discussed later in the text.5 Because of the high vascularity of the palatoglossal arch, accidental vascular injection is an ever-present risk. Careful aspiration helps to reduce this risk, but it cannot be avoided entirely. In addition, significant absorption of local anesthetic can be expected in this region. The addition of epinephrine to the local anesthetic solution helps to vasoconstrict the blood vessels in the region, reducing absorption as well as assisting in the diagnosis of intravascular injection by heart rate monitoring. As with any injection into a highly vascular region, this techniquemay be contraindicated in patientswith coagulopathies or anticoagulation. The glossopharyngeal nerve provides sensory innervation to the posterior third of the tongue, the vallecula, the anterior surface of the epiglottis (lingual branch), the walls of the pharynx (pharyngeal branch), and the tonsils (tonsillar branch). It is most easily blocked where it crosses the palatoglossal arch. It can be blocked using one of three methods: topical spray application, directmucosal contact of soaked pledgets, or direct infiltration by injection. 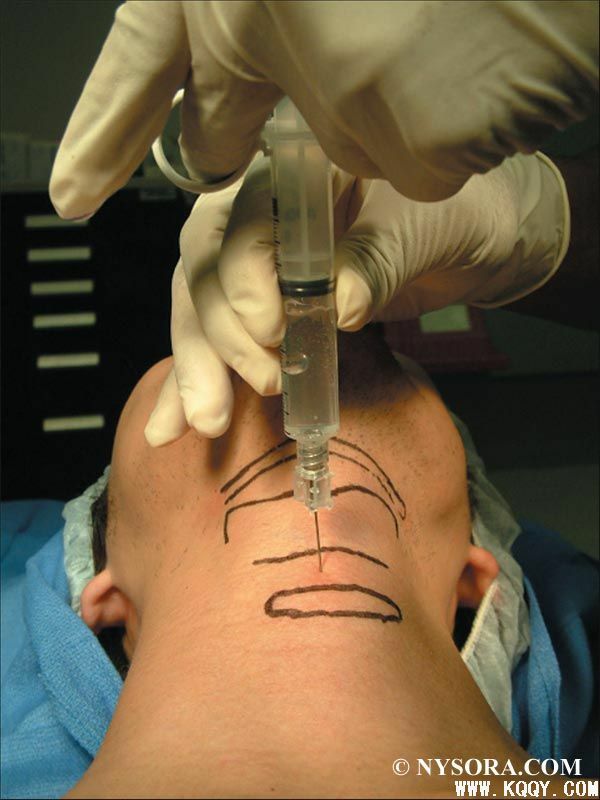 Glossopharyngeal nerve block is not adequate as a solo technique to facilitate intubation, but in combination with other techniques it is highly effective. Figure 6: Surface anatomy of the larynx: (1) Cricoid cartilage; (2) thyroid cartilage; (3) hyoid bone; (4) cornu of the hyoid bone. 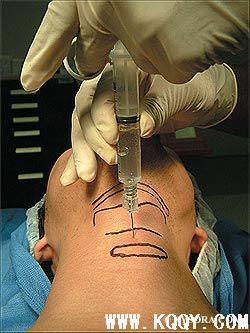 After topicalization, the most popular technique for superior laryngeal nerve block involves bilateral injections at the level of the greater cornu of the hyoid bone. The patient is placed supine with the head extended as much as possible. The patient’s skin is cleaned with an appropriate antimicrobial solution (eg, betadine). The cornu of the hyoid bone is located below the angle of the mandible. 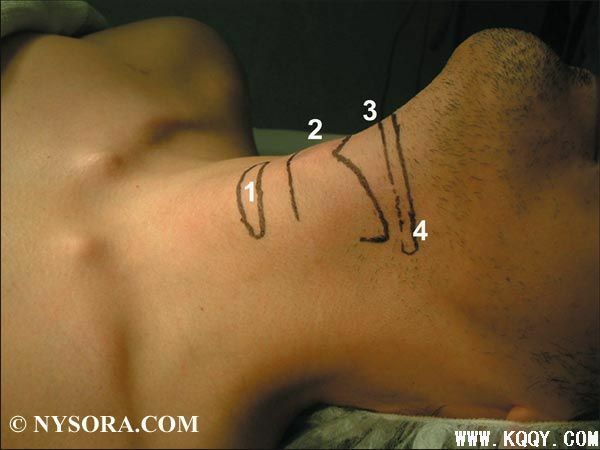 It is easily identified (particularly in men) by palpating outward from the thyroid notch along the upper border of the thyroid cartilage until the greater cornu is encountered just superior to its posterolateral margin (Figure 6). The nondominant hand is used to displace the hyoid bone with contralateral pressure, bringing the ipsilateral cornu and the internal branch of the superior laryngeal nerve toward the anesthesiologist. The anesthesiologist can then appreciate the pulsation of the carotid artery being displaced deep to the palpating finger tip. Figure 7: Superior laryngeal block. A 5/8 -in., 25-gauge needle is inserted in an anteroinferomedial direction until the lateral aspect of the greater cornu is contacted (Figure 7). If the needle is then walked downward toward the midline (1–2 mm) off the inferior border of the greater cornu, the thyrohyoid membrane is pierced and the internal branch alone is blocked. 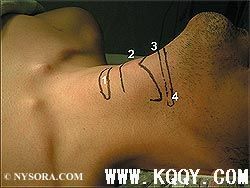 If the needle is retracted slightly after contacting the hyoid, both the internal and external branches of the superior laryngeal nerve are blocked. The syringe is then aspirated, and if aspiration is negative for air and blood, 2 mL of local anesthetic (2% lidocaine) with or without epinephrine (1:300,000) are then injected. If aspiration results in air, the needle tip is likely in the larynx and needs to be retracted. If blood is encountered, the needle may have encountered a blood vessel. Given the proximity of the carotid artery, it is advisable to withdraw the needle, reassess the landmarks, and reattempt the procedure. The superior laryngeal nerve can also be approached in the pre-epiglottic space. The pre-epiglottic space is accessed at a point 2 cm lateral to the thyroid notch. The needle is advanced 1–1.5 cm superoposteriorly to pierce the thyrohyoid membrane, and the nerve can be injected. Alternatively, using the thyroid cornu as a landmark and walking the needle superoanteromedially can accomplish this block. The superior laryngeal nerve innervates the base of the tongue, posterior surface of the epiglottis, aryepiglottic fold, and the arytenoids. Blockade is usually inadequate as a solo technique for intubation. Noninvasive blockade involves topicalization of the oral cavity, but this technique often proves inadequate. Direct infiltration is accomplished at the level of the thyrohyoid membrane inferior to the cornu of the hyoid bone. A reliable block with a definite endpoint is effected by retracting the needle marginally after contacting the greater cornu and injecting 2mL of local anesthetic after negative aspiration. Less invasive blockade can be accomplished by placing anesthetic-soaked cotton pledgets into the pyriformfossae bilaterally. The recurrent laryngeal nerve provides sensory innervation to the vocal folds and the trachea. Blockade of this nerve is necessary to provide comfort and prevent coughing while the endotracheal tube is being paused between the vocal cords. Sufficient blockade of the recurrent laryngeal nerve can often be accomplished using the inhalational technique previously described. Again, some patients may not achieve a sufficient amount of anesthesia to facilitate intubation. Another technique for blocking the sensory input of the recurrent laryngeal nerve is the transtracheal block. In this technique, the cricothyroid membrane is located in the midline of the neck. It can be located by palpating the thyroid prominence and proceeding in a caudad direction. The cricothyroid membrane is identified as the spongy fibromuscular band between the thyroid and cricoid cartilages (Figure 8). After sterile skin preparation, the overlying skin is anesthetized by raising a small skin wheal of local anesthetic. Then a 22- or 20-gauge needle on a 10-mL syringewith 4mL of 4%lidocaine is passed perpendicular to the axis of the trachea and pierces the membrane. (Alternatively, a 20-gauge angiocath can be passed. )While the needle is being advanced, the syringe is continuously aspirated. The needle is advanced until air is freely aspirated, signifying that the needle is now in the larynx (Figure 9). Instillation of local anesthetic at this point invariably results in coughing. Through coughing, the local anesthetic is dispersed, diffusely blocking the sensory nerve endings of the recurrent laryngeal nerve. Motor function remains completely unaffected. It is advisable to use a larger-gauge needle for this block. A more rapid delivery of local anesthetic reduces the risk of needle-induced trauma due to coughing. Figure 8: Transtracheal Block. The needle is inserted into the trachea transcutaneously. Figure 9: Transtracheal Block. Appearance of an air bubble in the syringe while the syringe is being aspirated. Direct blockade of the recurrent laryngeal nerve is contraindicated. This is because it may result in the upper airway obstruction, since the recurrent laryngeal nerve provides motor innervation for all themuscles of the larynx except the cricothyroid. In contrast, unilateral blockade typically manifests only as transient hoarseness. Recurrent laryngeal nerve provides sensory innervation to the trachea and vocal folds. Blockade facilitates comfortable passing of the endotracheal tube into the trachea. This nerve can be blocked by using topicalization techniques described previously. Translaryngeal block of the recurrent laryngeal nerve is easily accomplished at the level of the cricothyroidmembrane. A 10-mL syringe with a 22- or 20-gauge needle is advanced until air is aspirated into the syringe. Four milliliters of local anesthetic are then injected, inducing coughing that disperses the local anesthetic. The recurrent laryngeal nerve can also be blocked by spraying local anesthetic via the injection port of the fiberoptic bronchoscope. An oral approach to the pterygopalatine ganglion is described with needle passage through the greater palatine foramen into the pterygopalatine fossa. A percutaneous approach via the mandibular notch is usual performed under fluoroscopic guidance for pain management. Because of technical difficulty and the high risk for vascular injury, these techniques are rarely needed or used for nasal-passage anesthesia during fiberoptic intubation. They are mentioned here only for the sake of completeness and academic discussion. Nasal intubation requires blockade of the nasal passages. Blockade of the greater and lesser palatine nerves blocks sensation to the nasal turbinates and posterior two thirds of the nasal septum. Topicalization of these structures is typically effective for intubation. Alternatively, the pterygopalatine ganglion can be blocked by passing a local anesthetic-soaked cotton applicator along the upper border of the middle turbinate to the posterior wall of the nasopharynx, where it is left for 5–10 minutes. Transoral and percutaneous approaches to the pterygopalatine ganglion can be accomplished, but technical difficulty and an increased potential for complications preclude their routine use. The remaining portions of the nasal passages to be blocked are innervated by the anterior ethmoid nerve and is usually adequately blocked by inhalational or spray topicalization. This nerve can be selectively blocked by direct mucosal contact application with an anesthetic-soaked cotton applicator passed along the dorsal surface of the nose until the anterior cribiform plate is reached. The applicator is left in this position for 5–10 minutes. The anterior ethmoid nerve innervates the remainder of the nasal passage. Anesthetic-soaked cotton applicator is passed along the dorsal surface of the nose until the anterior cribiform plate is reached to achieve selective blockade after 5–10 minutes. Administer antisialogogue (glycopyrrolate 0.2–0.4 mg + dyphenhydramine (Benadryl) 20 mg IM) at least 20–30 minutes before fiberoptic instrumentation. Provide judicious sedation using appropriate doses of midazolam and fentanyl/alfentanil and/or dexmedetomidine. Use benzocaine spray to anesthetize the oral cavity and pharynx. Apply a generous amount of2%lidocaine ointment on the Ovassapian airway, and insert the tip of the airway in the patient’s mouth. As the lidocaine ointment is dissolved, it is carried deeper into the pharynx and swallowed by the patient. The airway is then advanced deeper as tolerated by the patient every 2–3 minutes. Eventually, the patient should be able to swallow the entire airway without discomfort. Attach a 5-mL syringe containing a solution of 4% lidocaine to the insufflating port of the flexible bronchoscope. Inject 2 mL of local anesthetic over the epiglottis, wait 15 seconds, and advance the scope (anesthetizes the epiglottis and superior aspect of the cords). Inject 1mL of local anestheticwhen the tip of the scope is just above the vocal cords; wait 15 seconds and advance the scope (anesthetizes cords). Inject 2 mL of local anesthetic when the tip of the scope passes underneath the vocal cords (anesthetizes the trachea). Advance the scope until the carina is seen. Advance the endotracheal tube over the fiberoptic scope. If unable to intubate using the above method, attempt appropriate blockade of individual nerves until the patient is able to tolerate intubation. Faccenda KA, Finucane BT: Complications of regional anaesthesia: Incidence and prevention. Drug Saf 2001;24:413–442. Auroy Y, Narchi P, Messiah A, et al: Serious complications related to regional anesthesia: Results of a prospective survey in France. Anesthesiology 1997;87:479–486. Naguib M,Magboul MM, Samarkandi AH, AttiaM: Adverse effects and drug interactions associated with local and regional anaesthesia. Drug Saf 1998;18:221–250. Cotter JT,Nielsen KC, GullerU, et al: Increased body mass index and ASA physical status IV are risk factors for block failure in ambulatory surgery: An analysis of 9,342 blocks. Can J Anaesth 2004;51:810– 816. American Society of Anesthesiologists Task Force on Management of the Difficult Airway: Practice guidelines for management of the difficult airway: An updated report by the American Society of Anesthesiologists Task Force on management of the difficult airway.Anesthesiology 2003; 98:1269–1277. Rose DK, Cohen MM: The airway: Problems and predictions in 18,500 patients. Can J Anaesth 1994;41:372–383. Netter F: Atlas of Human Anatomy. Ciba-Geigy Corporation, 1989, Plates 37–40. Netter F: Atlas of Human Anatomy. Ciba-Geigy Corporation, 1989, Plate 56. Avitsian R, Lin J, LottoM, Ebrahim Z: Dexmedetomidine and awake fiberoptic intubation for possible cervical spine myelopathy: A clinical series. J Neurosurg Anesthesiol 2005;17:97–99. Brookman CA, Teh HP, Morrison LM: Anticholinergics improve fibreoptic intubating conditions during general anaesthesia. 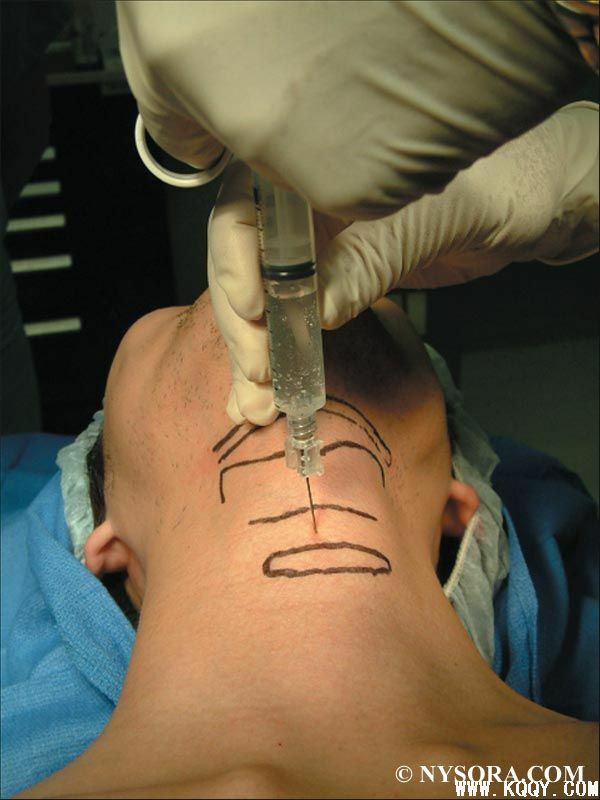 Can J Anaesth 1997;44:165–regional_topical_anesthesia_for_endotracheal_intubation. Vloka JD, Hadzic A, Kitain E: A simple adaptation to the Olympus LF1 and LF2 fiberoptic bronchoscopes for instillation of local anesthetic. Anesthesiology 1995;82:792. Greenblatt DJ, BenjaminDM,Willis CR, et al: Lidocaine plasma concentrations following administration of intraoral lidocaine solution. Arch Otolaryngol 1985;111:298–300. Nydahl PA, Axelsson K: Venous blood concentration of lidocaine after nasopharyngeal applicationof 2%lidocaine gel.ActaAnaesthesiol Scand 1988;32:135–139. Parkes SB, Butler CS, Muller R: Plasma lignocaine concentration following nebulization for awake intubation. Anaesth Intensive Care 1997;25:369–371. Furlan JC: Anatomical study applied to anesthetic block technique of the superior laryngeal nerve. Acta Anaesthesiol Scand 2002;46:199– 202. Netter F: Atlas of Human Anatomy. Ciba-Geigy Corporation, 1989, Plates 70, 71. Wheatley JR, Brancatisano A, Engel LA: Respiratory-related activity of cricothyroid muscle in awake normal humans. J Appl Physiol 1991;70:2226–2232. .Woodson GE, Sant’Ambrogio F, Mathew O, Sant’Ambrogio G: Effects of cricothyroid muscle contraction on laryngeal resistance and glottic area. Ann Otol Rhinol Laryngol 1989;98:119–124. Curran J, Hamilton C, Taylor T: Topical analgesia before tracheal intubation. Anaesthesia 1975;30:765–768. Kundra P, Kutralam S, Ravishankar M: Local anaesthesia for awake fibreoptic nasotracheal intubation. Acta Anaesthesiol Scand 2000;44:511. Reasoner DK, Warner DS, Todd MM, et al: A comparison of anesthetic techniques for awake intubation in neurosurgical patients. J Neurosurg Anesthesiol 1995;7:94–99.